The following is a post sponsored by appSmitten. For our sponsored post policy, click here. Like whoa, there are a lot of apps out there. Whether it’s for your iPhone, iPad or Android phone, there are about 3 million apps to choose from. Okay, maybe not quite that many. But, no doubt, there are a lot, with new ones coming out every day. But how do you separate the good from the not so good? Helping to make the app-o-sphere easier to navigate—and download decisions much, much easier to make—is a site called appSmitten. As their tagline says, they help you find your appy place. Like FBG, the site is editorially independent, so they hand-pick apps because they actually like them and find them useful. So, basically, it’s like having a friend who is super techie give you the 411 on apps. 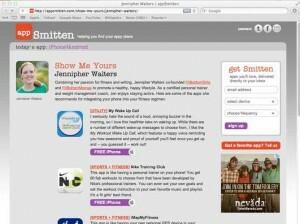 We recently shared our top three health and fitness apps with appSmitten for their “Show Me Yours” feature. The feature won’t be live until next week, but you can get a sneak peek here. In the meantime, be sure to sign up for appSmitten. You can get their app recommendations delivered straight to your inbox daily or weekly. And when you sign up before 5 p.m. EST on Friday, Dec 2, you’ll be entered to win a holiday makeover from MAC. A giveaway and free recommendations from girls who know their apps? Well, we’re just smitten. Just heard from appSmitten and the winner is…Courtney Mesmer! Congrats! AppSmitten will be contacting you soon — woohoo!